A few years back, my son saw the title of a book I was reading. As a pastor's child, he attended church weekly because it was an expectation I had of my children when they lived at home. Adults now, my children are philosophical and thoughtful, each in their own ways. But they do not attend a church. 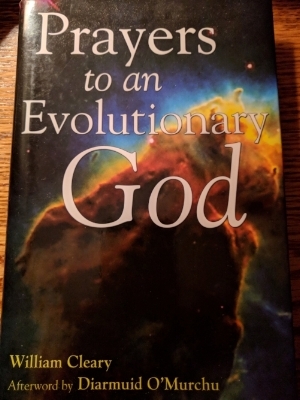 When my son saw the title of this book, Prayers to an Evolutionary God, he said something to the effect of, "if that's the kind of God churches talked about more often, I'd be interested in going." It's a great book. I return to it often. William Cleary is a former Jesuit priest, filmmaker, and composer and is married to a Unitarian Universalist minister. Diarmuid O'Murchu is a priest and social psychologist whose books include Quantum Theoloy: Reclaiming Spirituality and Our World in Transition. This is not a traditional look at our own personal salvation. It is much more community oriented and not just a church or faith community. The prayers focus on God, on our attempted understanding of the sacred stories of the Bible and of our place in the cosmos. We are not the center of the universe. It is huge. What books do you continue to go back to, which inspire you, and give you a sense of hope?